The Bear mattress targets those with an active lifestyle, with claims of pain relief and improved muscle recovery. But is the Bear mattress right for your needs? Note: This review is for the Bear mattress, a bed that's available exclusively online. The company claims the Bear mattress has features to improve pain relief and recovery for those with an active lifestyle. But did we notice in our review? Read on to find out. 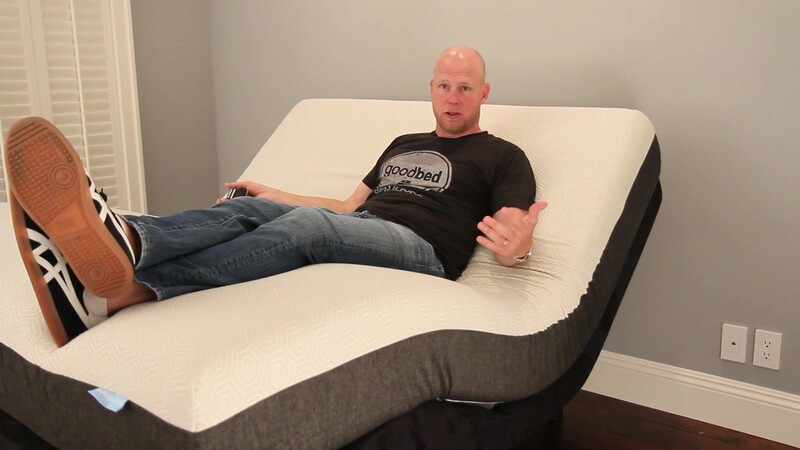 If you’d prefer to watch rather than read, check out our full Bear mattress video review above. GoodBed's Take – Who Is the Best Match for a Bear Mattress? The Bear mattress makes some pretty big claims, from asserting that it can "enhance tissue oxygen levels" and that the mattress "harnesses your body's natural energy to expedite recovery times and overall well-being." First, the mattress includes graphite and gel flecks in its 1-inch layer of memory foam. Both are proven conductors of heat, so the assumption is that they can channel heat away from the body, helping you stay cool. 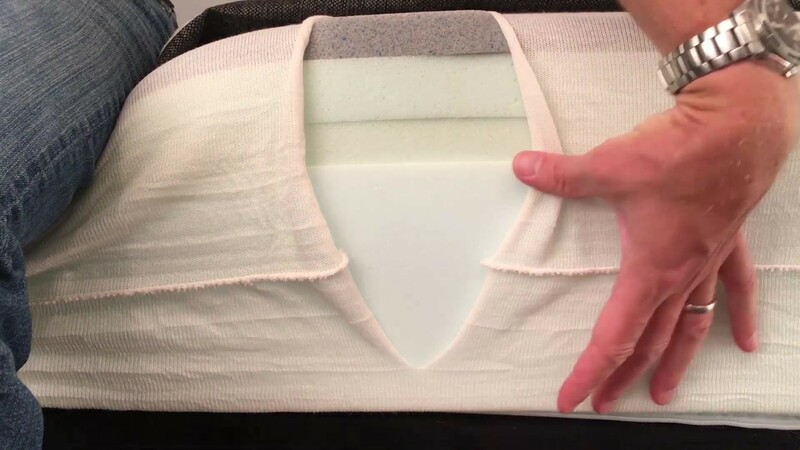 But the cover of the Bear mattress gets most of the buzz: it includes fibers of what the company calls Celliant, a synthetic material that also claims heat-regulating and pain-relief properties. Did we notice any of that in our testing? We didn't. That doesn't mean those claims aren't true (the company links to a number of studies (most are still pending) that aim to prove its claims), but they are subjective factors that are impossible to evaluate objectively. Rather, we subjected the Bear mattress to our battery of standard tests for support, motion isolation, edge support and other concrete factors. For owner ratings and reviews on the Bear mattress, which can speak to individual and subjective factors, be sure to check out the Bear owner reviews on GoodBed. Overall, based on our evaluations, we thought that the Bear mattress would suit a wide variety of individuals of average that sleep in a variety of positions. For our tester, spinal alignment and support while back sleeping was very good. Side sleeping and stomach sleeping were also good for our 200-lb. tester. In all cases, we had concerns that those on the more extreme weight spectrum (very light people under maybe 125 lbs., and heavy people over around 250 lbs.) might explore other mattress options. This 10" all-foam mattress does include a bit of memory foam, but we would not call it a memory foam bed; there just isn't much of it, and instead of typical slow-responding memory foam, it is rather quick to spring back, so there isn't much of that melting into the bed feeling. We found the Bear mattress to fall right into the middle in a lot of aspects, and if you are a sort of person that likes a blend of floating on top of your mattress vs sinking deeply into it, the Bear mattress may be a good option. Edge support, ease of repositioning, and motion isolation were all above average compared to typical all-foam mattresses, but if any of those are a major priority for you, other mattresses have features specifically to address those needs. Price-wise, the Bear mattress is competitive with other sold-on-the-internet beds, with industry-standard free delivery and a 100-night trial period with full refund and pickup. You can place the Bear mattress atop the support of your choice, including a separately purchased box support (the company sells a foundation of its own), a bed frame, platform bed, or adjustable bed frame. And the Bear bed comes in just one style—there are no choices to make other than size. 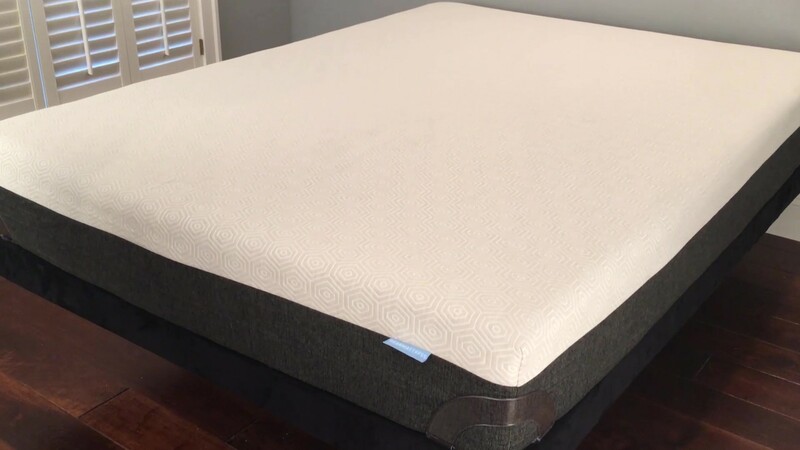 The top layer of the Bear mattress is memory foam, but we would not class this as a memory foam bed; there isn't much of the material, and compared to a typical slow-responding memory foam, this is a quick responding foam that springs back rather quickly. Graphite and gel are both known conductors, and they're included in the memory foam layer to help regulate heat. Next come two layers of progressively firmer polyurethane foam, with a 6.5" chunk of solid support foam at the bottom. The four layers of the Bear mattress are covered in a tight cover with the company's Celliant material, which it claims "activates the body’s natural heat and reflects it back as infrared energy, a common tool used to reduce inflammation." Aside from that, the tightness of the cover had some interesting effects on motion isolation (more on that below in the section on Motion Isolation). We classify the Bear bed as a straight-up Medium, right in the middle in terms of softness. That means it's a blend of sinking into the mattress versus more of a floating on top feeling. The Bear mattress is available in only one version. Cushioning depth refers to how deeply you sink into the mattress. We also class the Bear mattress as a Medium in this respect. Our tester did not sink so deeply that he felt encased or trapped by the mattress, but did feel nice compression and body conformity on the surface level of the Bear mattress. The Bear mattress was interesting in this respect. Most all-foam beds are very quick responding, meaning they spring back almost immediately and don't have much (if any) bounce. But the small amount of memory foam does have a small effect, and with both of our bounce tests using a 16-lb. bowling ball, as well as the full weight of our 200-lb. tester, we did note a little bit of bounce. So once again, we felt the Bear mattress to be sort of in the middle, with a little bounce, and a little of that memory foam feel. Overall, we thought the Bear mattress would suit a wide variety of people who sleep in a range of positions. That means the Bear mattress could be worth consideration if you don't sleep in any one position predominantly, or have a partner that sleeps in a different position than you. We did have concerns for people at the far ends of the weight spectrum in terms of support and spinal alignment. Our 200-pound tester felt the Bear mattress to be very supportive in this position. He felt his hips sunk in appropriately to create a neutral spine position, with lumbar and lower back areas well supported. We felt that most people of average weight would have a similar experience. For those quite a bit heavier than our tester, we felt they might sink through the Bear bed's comfort layers and bottom out on the harder support layer of foam. Spinal alignment for our tester in the side position was also good. We did notice a bit of upward tilt to his spine in this position, but it was not bothersome to him. For those who sleep occasionally on their sides, we felt the Bear mattress would be just fine. Again, those who are much heavier than our tester might find their hips don't sink far enough into the bed in this sleeping position. Overall, we found the pressure relief offered by the Bear mattress to be good, especially for people of our tester's weight or lighter. We felt pressure relief would be better with more memory foam material up top, so most of the pressure relieving qualities of this bed are coming from the two polyurethane layers below. We did not think that most people would have an issue with pressure relief, with the exception of those on the very heavy side of the weight scale, who may find themselves sinking through the soft layers of foam and resting on top of the much-firmer support layer. For the average person, pressure relief with the Bear mattress should be fine, but for those whose needs are acute, such as those with arthritis or fibromyalgia, or for those who are particularly heavy, the Bear bed may not be the best choice. With a bowling pin standing upright on the Bear bed, we tested motion isolation by dropping a 16-lb. bowling ball on it, as well as the whole weight of our 200-lb. tester. Foam beds in general typically ace this test, but we had some unique observations regarding the Bear bed. When we dropped our bowling ball, the pin wiggled a bit but did not fall. When our tester dropped his weight on the bed, however, the pin fell over. In practical terms, this means that a partner on one side of the bed could be disturbed by movements on the other side. 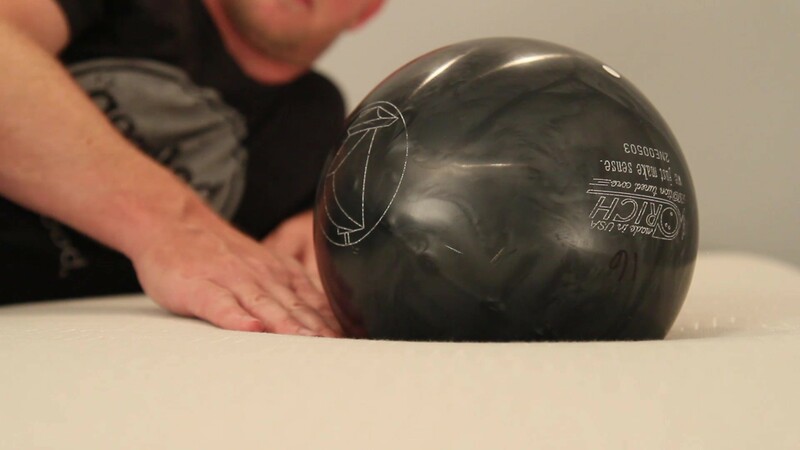 However, we didn't feel the foam was responsible for this: Rather, it's the tight cover, which has very little stretch, so little that our tester's body pulled the cover with him when he dropped on the Bear bed, pulling the base of the bowling pin with it. We didn't think that most people would experience this as a big issue, but if you are particularly sensitive to being disturbed by other movement on your bed, it could be a concern for you. For most people, we think the Bear mattress will not feel hot. Foam beds in general are not the best choice if you are a person that tends to sleep hot. But the Bear bed has a few advantages. First, this is not a bed with very deep cushioning, so more of your body is exposed to the air. We can't tell how much effect it might have, but the top memory foam layer does include heat-conducting graphite and get. And lastly, the cover includes Celliant fibers, which the company says help channel heat from the body as well. 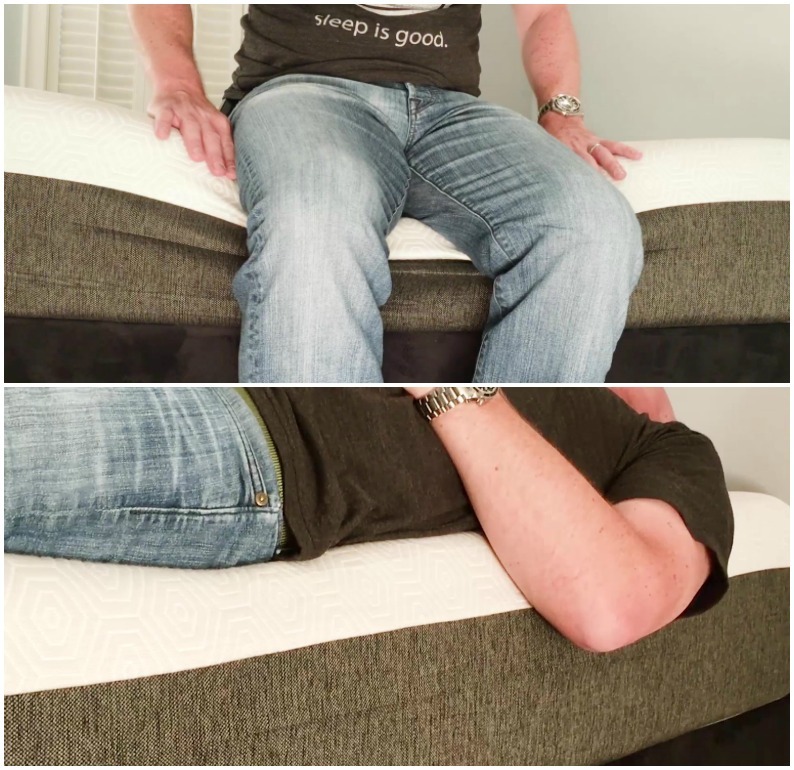 Foam mattresses aren’t typically very supportive along the very edge of the mattress—important if you like to sit on the edge of the bed, or if you tend to sleep along the edge. With the Bear mattress, our tester did experience a substantial amount of dip when sitting on the edge of the mattress, but he did feel stable. When laying on the very edge of the mattress, our tester felt himself leaning just a bit, but again did not feel unstable or like he was going to fall off. If sleeping right on the edge is a regular habit for you, other mattresses do have specific features to address this, but for most people, with think the Bear bed offers enough edge support. If you change positions a lot at night, ease of repositioning may be a concern. Our tester didn't have any trouble rolling from side to side or changing positions on the Bear bed. In the case of the Bear mattress, this is a not a natural bed, but all of the foams used are certified to the CertiPUR-US standard, which verifies that a material has low VOC off-gassing as well as a lack of chemicals and other substances regulated by the CPSC. The graphite included as flecks in the memory foam are a natural material, and the company says its Celliant fibers are made from natural materials. If you plan to use your mattress atop an adjustable base, the Bear bed is a good choice, and you won't damage the mattress by doing so. We did note that out of the box, the mattress did not conform perfectly to the adjustable base we used. Like many foam beds, it will need a break in period. But given a little time, we did not foresee any issues with using the Bear mattress on an adjustable base. The Bear bed is a 10-inch all-foam mattress with a few less common features. The top one-inch layer of memory foam includes flecks of graphite and gel, both intended to help channel heat from the body. And the cover includes the company's Celliant fibers, about which the company makes several claimed benefits, from reducing inflammation to improved circulation. We found the mattress to be well made, using good quality materials. When it comes to estimating the comfort lifespan of a mattress, we tend to use foam density as our best, albeit imperfect, predictor of how long a foam will retain its shape and resiliency. In the case of the Bear mattress, the comfort layers of the bed are 3-lb. and 4-lb. density foams, both good quality densities for a mattress in this price range. The lower support layer is a standard 1.8-lb. foam, typically used as the support layer in foam beds. We did not see any obvious weak leaks that would lead us to believe the Bear mattress would deteriorate any faster than competing foam beds. On balance, we feel that the Bear mattress compares well to the competition in terms of materials quality and price. For you, the question of value may come down to your confidence in the manufacturer's claims regarding the benefits of its Celliant material as a health benefit. But even aside from that, we felt that the Bear bed is a solid value. Bear includes free delivery, which is not particularly unusual among its competitors. One of the biggest, if not THE biggest complaints about any mattress from consumers regards body impressions—the inability of a mattress to spring back, eventually creating a low spot/sinkhole in the mattress. As such, mattress warranties all contain a term defining how big a sag or ‘body impression’ (measured when no one is on the mattress) is considered a defect, and thus covered under the warranty. The industry standard for mattresses is generally between ¾” and 1.5”. Bear has chosen to cover indentations that meet or exceed 1”. Practically speaking, that means any softening or sagging would need to be at least that deep before the warranty would offer you protection. See: Bear warranty policy. Summary: Is the Bear Mattress Right for You? We found the Bear mattress to be a good fit for a wide range of poeple. Based on our findings, here’s who we think is the best and worst match for a Purple mattress. Is the Bear bed right for you? Take our Mattress Match Quiz to find mattresses that fit your needs, based on your preferences and price range. Looking for more on the Bear mattress? Click here to visit their website at BearMattress.com.